If you haven't done it already, in mid-Michigan it is safe to take down all your hummingbird and oriole feeders in November. Clean them first before you store them away. You can use a one part vinegar or bleach to nine parts water solution to clean all of your feeders. Rinse your feeders thoroughly and put them in a special place you'll remember next spring. Or you can take advantage of our bird feeding service: Wild Birds Unlimited - East Lansing- will clean your feeder for $5.00 and have it ready for you the next day we are open. 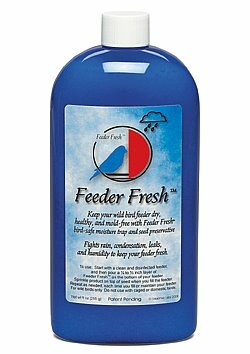 Any feeder you choose should be easy to fill and easy to clean. Look for quality. Most Wild Birds Unlimited feeders come with a Lifetime Warranty. Determine what birds you want to attract. There are certain feeders that are made for specific birds (i.e. finch feeder). Decide where you are going to put the feeder. Is it going to hang in a tree, on an Advanced Pole System, on a window, or off a deck? The best place to put a feeder is where you can view it easily. Look for a feeder you don't have to fill every day. Large capacity feeders like the Quick Clean Big Tube, Squirrel Buster Plus, and the Ranchette Retreat Hopper will all stay filled for at least a week. And our most popular winter feeders are the ones that hold our seed cylinders. For people that aren't able to get out to fill feeders often during our harsh Michigan winters this feeder is ideal. Seed Cylinders are tidy, long-lasting, tightly packed seed shapes held together with gelatin that slip on a cylinder feeder. The birds stay longer eating at the feeder instead of grabbing a morsel and flying quickly away to eat it elsewhere. And the cylinders are packed with high-calorie nuts to provide birds with enough energy stay warm. Weather Guards are designed to keep snow and rain from spoiling your seed in the tube. It's a clear plastic dome that slips on top of most tube feeders. It will not deter birds from feeding, in fact, many enjoy feeding under the shelter and out of the wet weather. It has a lifetime guarantee and is made in the USA. Trays not only catch seed falling from feeders but they also makes it more comfortable for ground feeding birds to eat at an elevated level where we can observe them. Attach a tidy tray to your seed tube or Catch-a-Seed trays with hopper bird feeders. Feeder Fresh can be added to the seed when you fill a feeder. It absorbs moisture and is safe for birds. Made from non-toxic absorbent sand, Feeder Fresh keeps the seed and feeder dry, preventing molds from forming, and thus reduces the chance of Aflatoxin and other mycotoxins. Wild Birds Unlimited doesn’t just sell the best bird feeders and bird food. We also give you accurate information about our local birds. If you have specific questions, don't be afraid to ask. We are Your Backyard Bird feeding Specialist®, here to help bring you, and nature together.